This post was originally published at Gracious Threads as part of their Embellish is for Boys series. Be sure to check out the whole series for a ton of great tutorials and projects for spicing up your boy clothes. 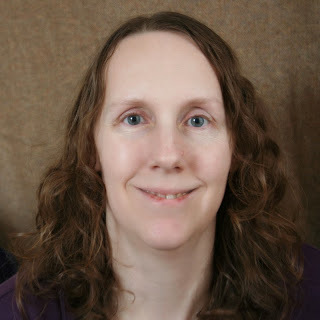 Hi, I'm Emily from Tangible Pursuits. 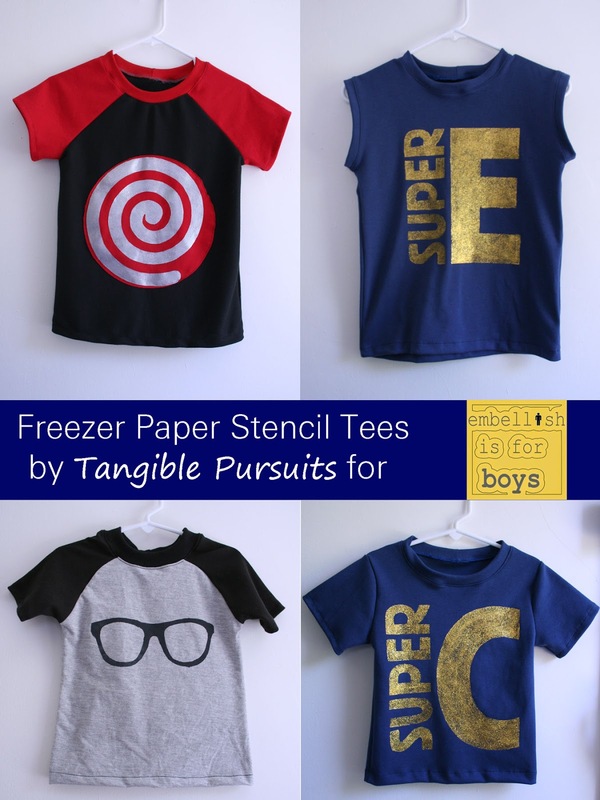 I'm here today to share some freezer paper stencil tees for Embellish is for Boys. I have two boys and I love to make clothes for them. Since I got a serger I have been making a lot more tees because it is so fast and easy. Plain tees can be a little boring, though, so it is fun to dress them up with embellishments. For this project I used clip art and fonts to create my freezer paper stencils. My big kid watches a lot of super hero shows. There is always a bad guy in those shows who hypnotizes people with one of those red and white spinning spirals. 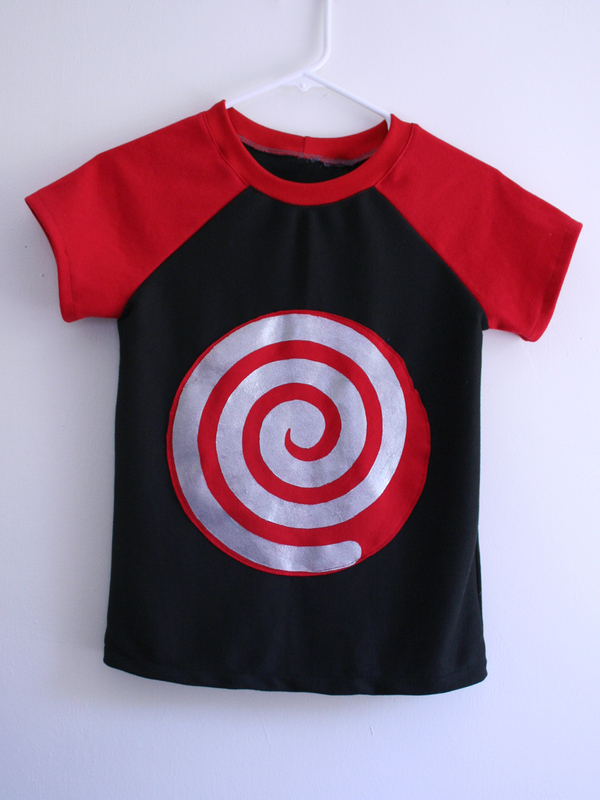 I decided to make the big kid a shirt with one of those spinning spirals on it. I found the spiral that I used on ClipArtBest.com. I opened the file in Word and resized it to be 10" wide and tall. It obviously went off the page that way, so I printed it twice - once aligned to the right and once aligned to the left. Then I trimmed off the margin on one of the pieces and taped them together. 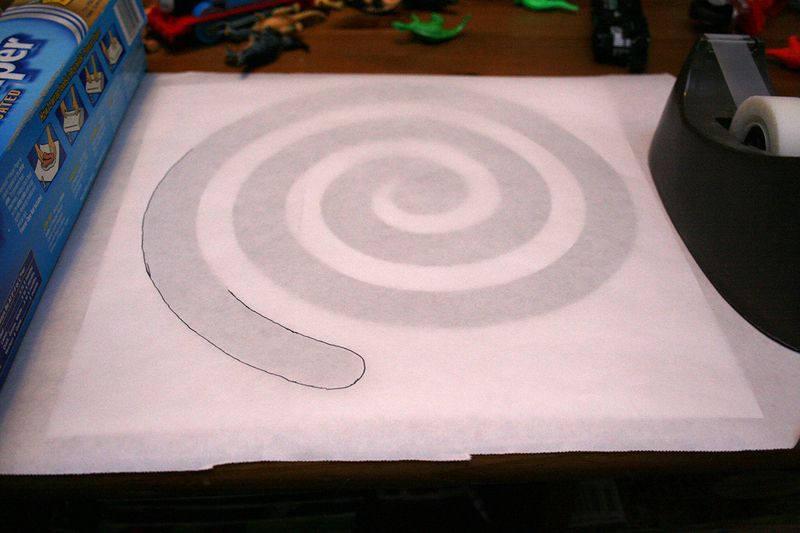 I then traced the shape onto the freezer paper. Next I cut out the spiral to make the stencil and ironed it onto my fabric. I used a red knit fabric that I had already cut into a 10" circle. Then I used a silver metallic fabric paint to paint the stencil. Don't forget to put cardboard behind your fabric to protect your surfaces! I used a flat rate box since I have a number of those laying around. Then I sewed my red circle onto the front t-shirt piece. I used a Simplicity raglan tee pattern for this shirt. In some places my spiral went very close to the edge of the red fabric, so I had to put a piece of freezer paper over it as I was sewing, to ensure that it wouldn't stick as I was sewing. I also used my Teflon foot just to be extra sure nothing would stick. Then I sewed the tee together as usual. When I showed it to the big kid, he immediately knew what it was and declared it "cool!" 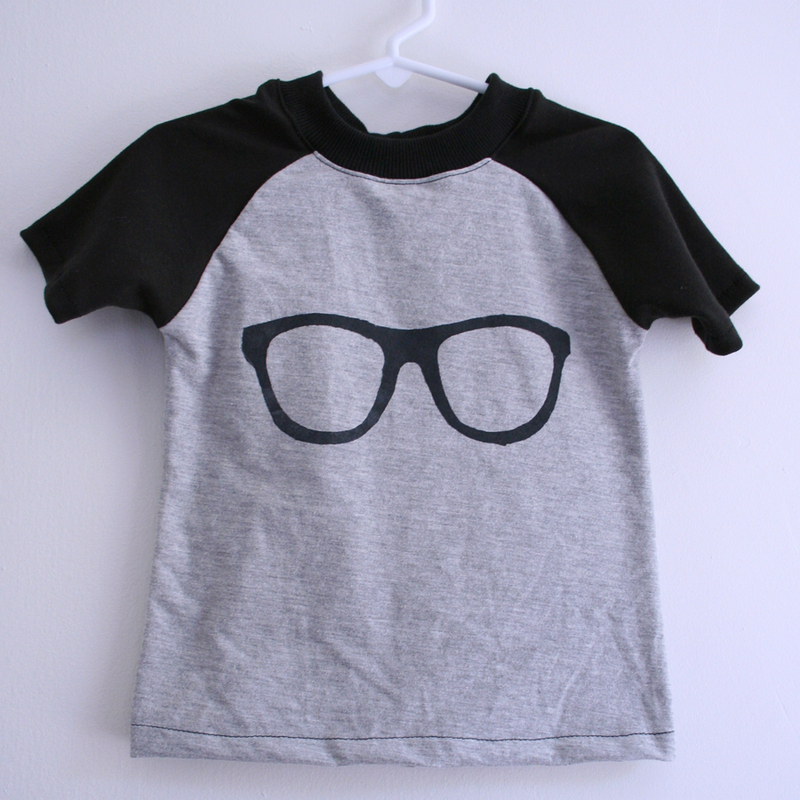 The little guy likes to put on glasses and pretend to be Daddy, so for his shirt I decided to make a glasses stencil. I found a perfect clip art of glasses on ClipArtBest.com. Because this one wasn't so big I was able to print it directly onto the freezer paper. To do this, just cut your freezer paper to approximately the size of a piece of paper and load it in your printer so that it will print on the non-shiny side. Then cut out, position over your fabric, iron on and stencil. I used a dark gray soft fabric paint. 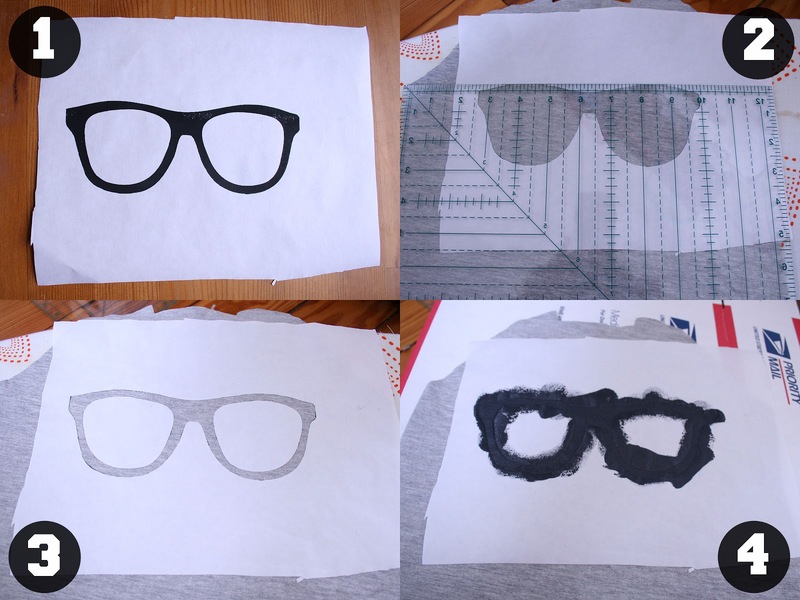 One of the cool things about making a stencil with freezer paper is that you can have unpainted areas in the middle of the shape - like with these glasses - something you can't do with a regular stencil without having weird skinny lines in the middle of your picture. You just have to make sure to cut out those center shapes and save them and then iron them down as well. For this shirt I used the raw-edged raglan pattern from Sewing for Boys (affiliate link), but I made it without the raw edges. 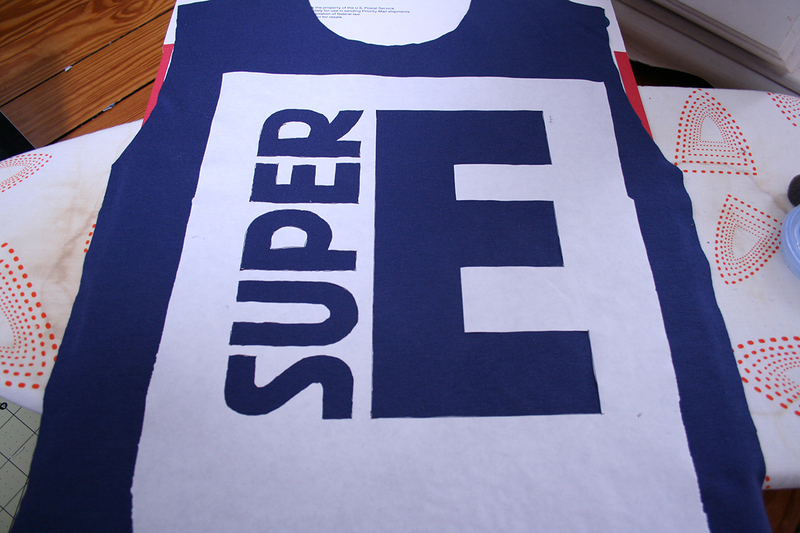 Finally I decided to make my boys matching "Super" shirts. 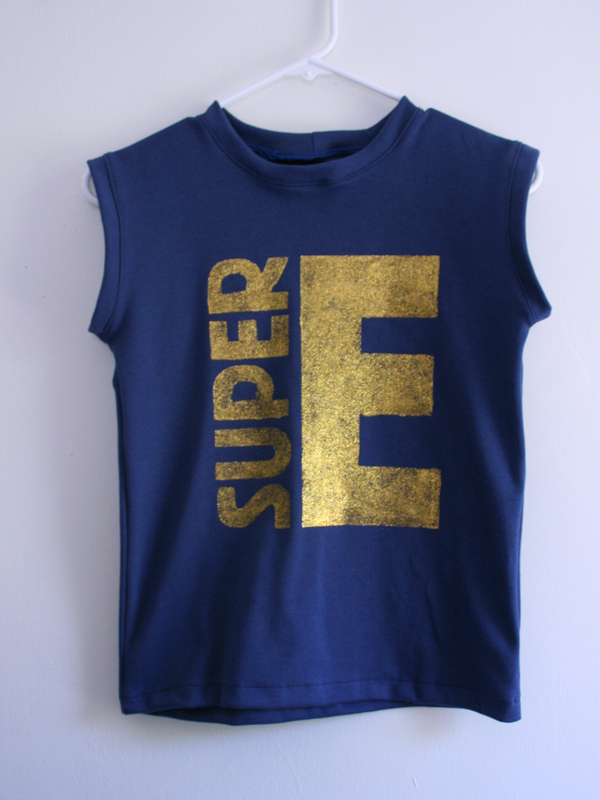 The big kid calls his super hero alter ego "Super E" because his first initial is E, so the little guy would be "Super C." For this one I just used Word's "Word Art" feature to turn "super" sideways and to adjust both "super" and the initial to be the same height. I had to print them on two separate sheets of paper again because they were too big to fit on one. Then I traced the letters onto a large sheet of freezer paper. and cut them out. 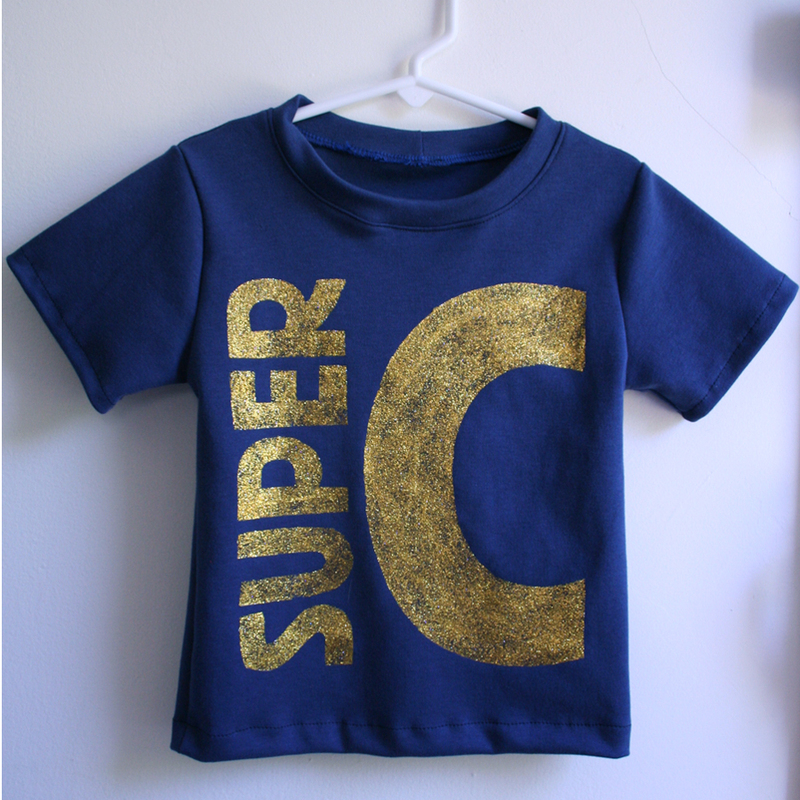 Don't forget to save the inner shapes of the "P" and "R."
I used a gold metallic paint for the super shirts. I showed the big kid his before it was completely sewn together and he asked me if it could be a tank top instead of a t-shirt. I agreed to leave the sleeves off. I sewed little cuffs onto the armholes (binding it might have made more sense, but this was faster). The pattern was the basic t-shirt pattern from Kwik Sew's Sewing for Children (affiliate link). So it came out looking like a muscle shirt which he was pretty happy with. Here is the little guy's. I used Sewing Mama RaeAnna's Cupcake top pattern for this one - I just left off the pocket and shortened the sleeves. Thanks for reading! I hope you found some good ideas to embellish your own tees with freezer paper stencils. These are great Emily! I love freezer stencils! Thanks! I think the glasses are my favorite. I love them all but the glasses is my favorite too. Always great when you can print right to the freezer paper and save a step.